Caption slip reads: “Photographer: Gaze. Date: For Monday 1955-04-18. Reporter: Gaze. Assignment: "Mrs. California" Contest. 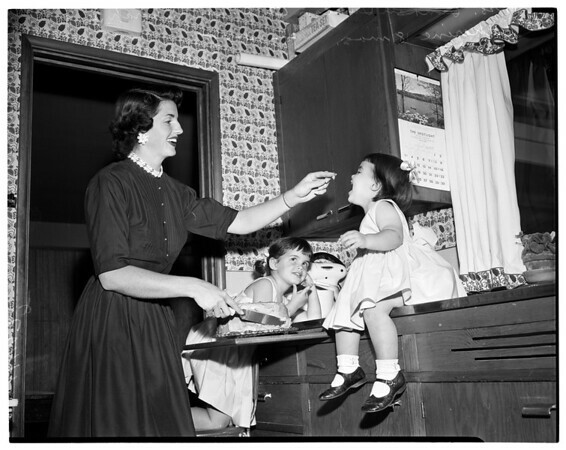 1/2/29: Testing a sample of the chocolate chiffon cake which their mother, Mrs. Duncan Chapman, will bake in the "Mrs. California" homemakers contest are Deborah, 4, (center) and Catherine, 18 months (right). A resident of Pacific Palisades, Mrs. Chapman has won both her local and regional contests. The state competition begins today at the Los Angeles Ambassador hotel".